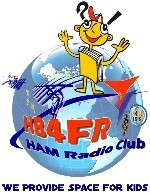 It is thanks to the unconditional support of Claude Nicollier, HB9CN, president of the Clin d'Ailes Museum Foundation Board, that the HB4FR club was able to realize this exhibition of telecommunication equipment in the Clin d'Ailes museum. We thank him warmly for his valuable advice, collaboration and commitment during our ARISS activities and World Space Week. We owe him a great deal of our success. The universe has always fascinated. In the sixteenth century, Galileo had already observed the stars through a telescope (which he has invented), Jules Verne imagined in his book "De la Terre à la Lune" (from the Earth to the Moon) a trip to the moon with a spaceship launched by a big gun. Regardless of the ages, the exploration of the universe was always a theme for humanity. During the cold war, the dream has become reality. In fact, the U.S. and the USSR, between 1957 1969, gave a real technological battle to prove their technological superiority in the event of a military attack, which crystallized around the conquest of space. As Swiss astronaut, our honorary member has also participated in the conquest of space. Indeed, in 1992 he became the first Swiss in space (Mission STS-46). 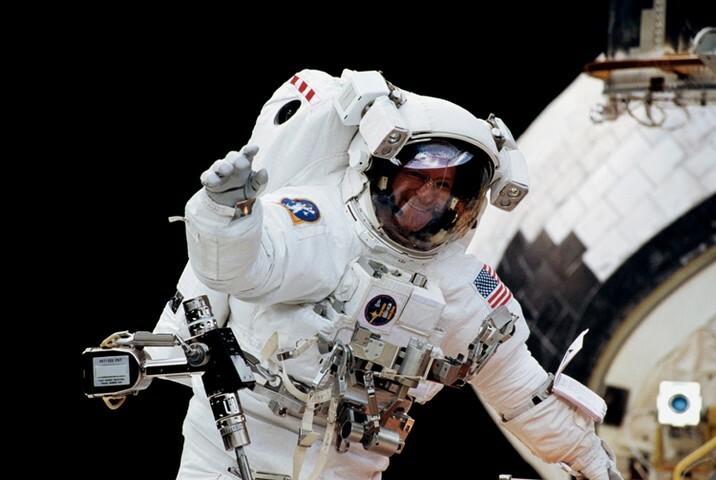 He now has more than 1000 hours spent in the space including an EVA (Extra Vehicular Activty) of 8 hours 10 minutes. He is the only astronaut who flew on the four American Space Shuttles. In 1992 on Atlantis, in 1993 on Endeavor, in 1996 on Columbia and finally in 1998 on Discovery. Claude Nicollier participates, as a mission specialist on Atlantis Space Shuttle flight STS-46 (July 3 - August 8, 1992), during which the crew launched the ESA European Retrievable Carrier (EURECA) and performs the first flight tests of the Tethered Satellite System (TTS). The mission accomplished 123 orbits around the Earth, more than 5 million kilometers in 191 hours 16 minutes. Then, as mission specialist, he participated in flight STS-61 (December 2-13, 1993) during which Shuttle Endeavor joined and rehabilitated the Hubble Space Telescope, a joint ESA / NASA program. Claude Nicollier was at the controls of the Shuttle remote manipulator system arm. The mission accomplished 163 orbits around the Earth, more than 7 million kilometers in 259 hours 59 minutes. 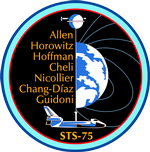 In January 1995, Claude Nicollier was selected for his third space mission, STS-75. 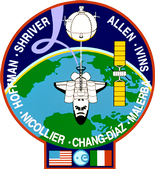 During this 15-day mission (22 February - 9 March 1996), the second deployment of the Tethered Satellite System (TSS) is attempted; the cable breaks while the satellite reaches a distance of 19.7 km from the shuttle. The astronauts then focused their activities on the US Microgravity USP-3 payload experiments. The mission accomplished 252 orbits around the Earth, more than 10 million kilometers in 377 hours 40 minutes. In August 1998, Claude Nicollier began the preparation of his fourth space flight, mission STS-103 (December 20–28, 1999). During this third Hubble Space Telescope maintenance mission, Claude Nicollier made his first Extra Vehicular Activity (EVA). He installs new systems and instruments to improve the performance of the orbital telescope. 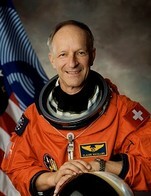 After retiring as an astronaut in 2007, Claude Nicollier now teaches space engineering at the Ecole Polytechnique Fédérale de Lausanne. Do not forget to visit the "Espace Nicollier" at the Clin d'Ailes Museum on your next visit ! !